The Samson Go Mic is the ideal portable microphone for podcasting, field recording, and more. Offering a smooth, flat frequency response of 20 Hz to 18 kHz and 44.1kHz/16-bit resolution the Go Mic provides professional audio results all the time. With no need for drivers, you can record music on your computer easily for Skype, iChat, voice recognition software, VoIP, web casting e.t.c.. The Go Mic captures solid vocals as well as instruments and guitar amps with every note thanks to its Switchable cardiod or omnidirectional pickup patterns and allows for zero-latency monitoring with the stereo 1/8” volume controllable headphone jack. The microphone is fully compatible with Mac OS or Windows and has an unobtrusive design that clips right onto your laptop or can be placed on your desk. It also comes with Music Creator software for higher-quality podcasts and features a USB output. 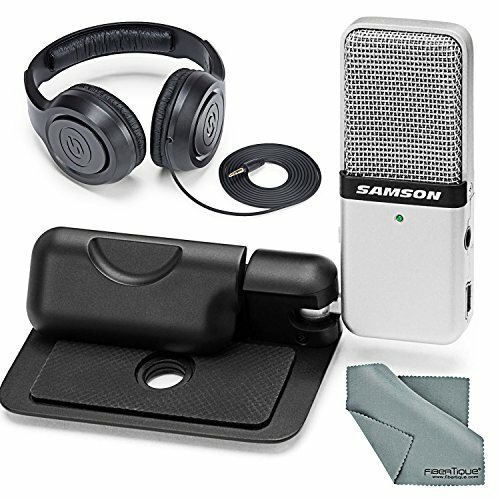 True to its name, the Samson Go Mic is a universal solution for recording music on your computer everywhere you go. FiberTique Cleaning Cloth - designed with extremely fine microfiber the cloth and leaves zero scratches, streaks or marks and is safe for use on all surfaces of electronic devices. Compact and portable microphone for podcasting, field recording, and more with 20 Hz to 18 kHz frequency response and 44.1kHz/16-bit resolution. Capture vocals or close-mic an instrument in cardioid mode and switch to omnidirectional mode to get the sound of the entire room. Record directly into your preferred software program with Go Mic that's fully compatible with Mac OS or Windows. The versatile Go Mic has an unobtrusive design that clips right onto your laptop or can be placed on your desk.